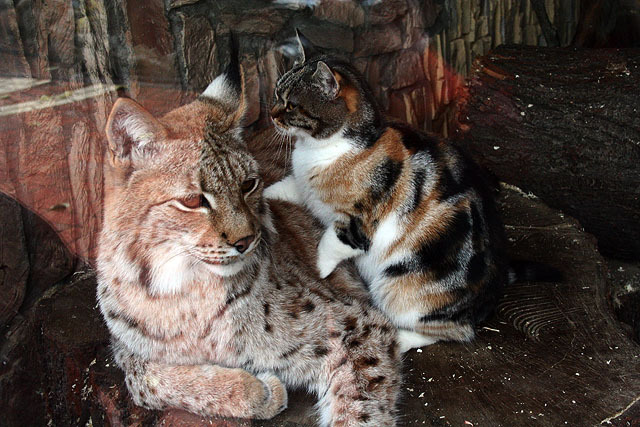 In St. Petersburg zoo the regular Russian cat has become friends with a big European lynx. 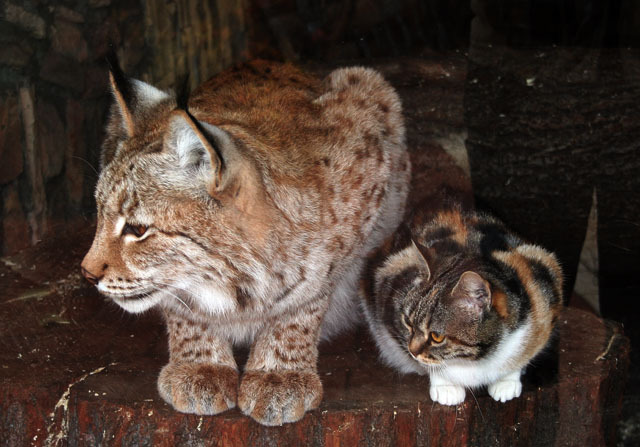 People say that they liver together in one big cage and the cat considers the lynx to be her mother. nice, well they are both cats. is this a Vanilla Sky reference? metaphor is obvious: small creature entrusting large creature, as the small country arise to the side with more extensive country: as Ukraina,georgia,estonia next to Russia!!!! but we know how as it will end,if small one wants to war, then it will struck downward with the powerful puff,killed on the spot and find the foot of dominator in its necks!!! !beware of russia, NASHI!!!!! Yes this way you can show world how huge inefficient country can barely invade a country with half the population of Moscow. Try Poland, you’ll get your own heads handed to you. That’s not true, I had a friend who had an illegal pet wolf up in Alaska and a Rottweiler as well. They got along ok considering that the wolf would often behave like the wild animal it was. They’d play roughly, but there was no hatred between them. Also, comparing cat’s to dogs is like comparing oranges and potatoes. The kitty’s like each other, it’s quite obvious. There’s a good video on youtube of a crow that raised and mothered a kitten a few years ago, check it out. Personally put bobcat kittens on a barn cat momma. The one surviving bobcat kitten were still sucking when it was the same size as the barn cat. Weaned itself eventually, but still hung out with the cats until it disappeared one day. Never did bother the domestic cats though. Have mercy on the cat. 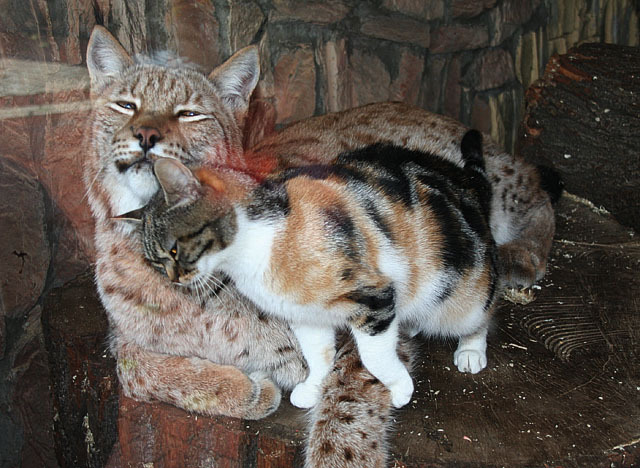 Just keep the Lynx WELL fed and there will be no trouble. Young animals “imprint” on their mothers, or any other adult thing around them, if their mother is missing. I had a kitten that I rescued, imprint on me! Researchers with geese have had gosslings imprint on adult humans. Human babies have been known (rarely) to imprint on wild animals. This imprinting is part of a near universal survival technique, at least in mammals. This is so amazing. Love in the animal world is unconditional. Man, I have so many favorite posts here on English Russia, I don’t even know what to say. I imagine the zoo becomes a lot more hilarious when either of those two is in heat. 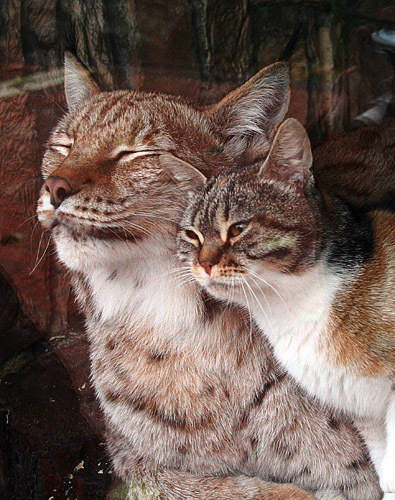 i detest people who wear lynx fur. Very lovely situation. I like animals and this pics make my love stronger. Fulgusor!!!!!!!! !